In South Africa malnutrition is of great concern. Vitamin A deficiency is one of the leading causes of infections as a result of micronutrient malnutrition. Although supplementation and food fortification programmes exist, these either are not available or are unaffordable to communities in remote rural areas. The selection of crops that are naturally rich in provitamin A (β-carotene) and other carotenoids that can be recommended to small-scale farmers for breeding and for food production, could be an effective way to address vitamin A deficiencies and associated diseases. The aim of this study was to profile two cultivars each of potato, tomato, bread wheat and durum wheat, which are highly consumed crops in South Africa, for their carotenoid content using high-performance liquid chromatography. To this effect, reliable extraction and quantification of five carotenoids - lutein, zeaxanthin, canthaxanthin, β-carotene and lycopene - were performed for these crops. Lutein and zeaxanthin were found to be the major carotenoids in potato, whilst lycopene was the major carotenoid in tomato. In durum wheat, only lutein and zeaxanthin were identified whilst bread wheat contained lutein, zeaxanthin and β-carotene. The methodology used proved to be robust and suitable to screen a large number of potato, tomato and wheat cultivars for their carotenoid content. Malnutrition, in general terms, is the medical condition caused by improper or inadequate nutrition. In developing countries, malnutrition contributes to 53% of deaths associated with infectious diseases among children under the age of five.1,2 In South Africa, malnutrition is responsible for up to 50% of the deaths of children that are admitted to hospital.3 Although there are many reasons for malnutrition, and many possible interventions to prevent it, the promotion of a diverse diet using micronutrient-rich and locally produced foods from locally grown crops could be a more long-term solution. Because humans rely on agricultural food crops as their primary source of nutrients and because the only way they can accumulate carotenoids in certain tissues is through ingestion, it is essential that food crops be the focus of analysis for nutritional content to generate a wider understanding of what each crop can provide to ensure an adequate and healthy diet. For this study, potato, tomato and wheat were the crops of choice because they are consumed in high amounts in South Africa, are grown in rural communities and are alternative foods to control dietary micronutrient deficiencies. In this study, the methods for extraction and quantification of carotenoids from potato, tomato and wheat cultivars were reproducible and robust. The data generated will constitute the baseline data of the carotenoid levels and of the carotenoid profiles for the three crops. This data can be used in the screening and evaluation of additional South African grown cultivars for their antioxidant properties. It is important to screen different cultivars to know which to recommend for growing by small-scale farmers and to support the development of new varieties that are high in carotenoids. All chemicals used were high-performance liquid chromatography (HPLC) grade and were purchased from Sigma (St Louis, MO, USA). Lutein, zeaxanthin, canthaxanthin, lycopene and β-carotene standards were up to 99% pure and acquired from Industrial Analytical (Johannesburg, South Africa). Water was purified using the Millipore Milli-Q water purification system (Millipore Corp, Bedford, MA, USA). Potato Mondial and BP1 commercial varieties were purchased from a local vegetable market in Pretoria, South Africa. The potato tubers were washed thoroughly, dried and placed into small plastic bags with holes in them. The bags were immediately immersed into liquid nitrogen and left there until the bubbling stopped. The bags were then immediately stored at -80 ºC before being freeze dried in the dark. The dried potatoes were transferred into vacuum bags, vacuum packed and stored at -20 ºC. Tomato Salad and Roma cultivars were also purchased from a local vegetable market in Pretoria. The tomatoes were thoroughly washed, dried and freeze dried whole immediately after purchase. Freeze-dried tomatoes were transferred into vacuum bags, vacuum packed and stored at -20 ºC. Bread wheat Elands and Mathabas cultivars and durum wheat Moni and Orania cultivars were made available to us by the Agricultural Research Council-Small Grain Institute in Bethlehem, South Africa. Because the grains were already dry, they were immediately vacuum packed and stored at -20 ºC. Carotenoids were extracted from potato, tomato and wheat using the protocol supplied by the Cereal Research Centre (CRA) in Foggia, Italy, with minor volume changes, depending on the crop. Powdered samples (2 g) of potato and wheat were resuspended in 8 mL of extraction solvent (hexane/acetone, 8:2 v/v) containing 0.1% butylated hydroxyl toluene. For tomatoes, 2 g of powder was resuspended in 10 mL of the above extraction solvent. The mixtures were streamed under nitrogen for 10 s to prevent oxidation, vortexed for 30 s and left in the dark at room temperature overnight. Following this period, samples were vortexed and centrifuged at 4000 g for 15 min. The pellet was washed with 4 mL of hexane and centrifuged as above. Supernatants collected after both centrifugations were pooled together and filtered using 0.45-µm, 25-mm GHP membrane syringe filters (Separations, Johannesburg, South Africa). The filtrate was dried under a gentle stream of oxygen-free nitrogen gas and then reconstituted in 400 µL methanol/dichloromethane (45:54 v/v). Final extracts were transferred into amber HPLC vials (Separations) and a sample volume of 20 µL was subjected to quantitative HPLC analysis. HPLC analysis was carried out using a Hewlett-Packard 1100 system with a diode array detector set for monitoring the wavelength at 450 nm. The system was also equipped with a binary pump, autosampler, column thermostat for temperature control (all G1312A) and G1656 ChemoStation software (Agilent Technologies, Santa Clara, CA, USA). Carotenoids were separated using an YMC C30 5-µm (250 mm x 2 mm) column coupled with a 20 mm x 2 mm, 5-µm guard column (YMC Inc., Waters, Milford, MA, USA). The column was kept at a constant temperature of 25 ºC and the flow rate was 0.4 mL/min. There were two mobile phases (A and B) made up with the same solvents at different concentrations: Phase A consisted of 83% methanol containing 15% tert-butyl methyl ether (TBME) and Phase B consisted of 8% methanol in 90% TBME. The following linear gradient of elution programme was used: starting with 100% mobile phase A, 8 min of 70% mobile phase A and 30% mobile phase B, 22 min of 45% mobile phase A and 55% mobile phase B, 24 min of 5% mobile phase A and 95% mobile phase B, and 27 min of 100% mobile phase B. The total separation time was 50 min. All five individual carotenoids - lutein, zeaxanthin, β-carotene, lycopene and canthaxanthin - were identified on the basis of retention times and absorption spectra between 450 nm and 470 nm, compared with those of pure standards. Approximately 5 mg of each standard was prepared in ethanol, except for lycopene which was prepared in petroleum ether. With each run, an aliquot was taken from each standard to verify its purity by HPLC and for calibrating the instrument (i.e. obtaining a chromatogram showing a single peak corresponding to the carotenoid and giving the same characteristic spectrum at all times). Instrument calibration was performed prior to each analysis cycle using 6-9 levels of different concentrations of the five carotenoid standards with a single or double injection. Pure standards were also used to construct standard curves used to determine the concentrations of carotenoids in the crops. Concentrations of the pure standards were determined spectrophotometrically using A1cm values and linear standard curves between 0.01 µg/mL and 10 µg/mL were created with r2 values of 0.999. 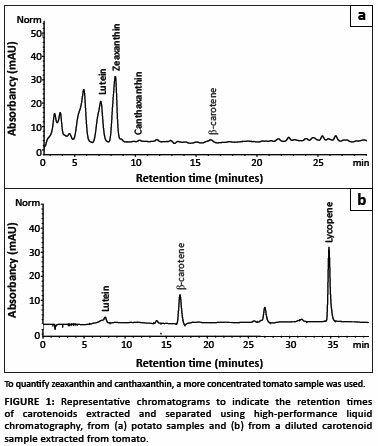 The limit of detection for each carotenoid was: lutein - 0.01 µg/mL, zeaxanthin - 0.02 µg/mL, lycopene - 0.02 µg/mL, β-carotene - 0.01 µg/mL and canthaxanthin - 0.02 µg/mL. Concentrations below these levels were denoted as not detected as they could not be accurately quantified. For recovery rate experiments, lutein and β-carotene standards used for spiking were separately prepared in ethanol. Aliquots (200 µL) of each standard with known concentrations were immediately added to three replicates of the dry, powdered samples of BP1 potato, Salad tomato and Durum wheat cultivars and carotenoids were extracted and analysed using the methods above. Percentage recoveries for each carotenoid were calculated using the following equation: [(CA - CU)/CB] x 100, where CA is the concentration of the specific carotenoid in spiked samples, CU is the average amount of carotenoid measured in unspiked samples and CB is the concentration of the carotenoid used to spike the sample. Carotenoid content per cultivar is expressed as mean ± standard deviation of three replicate experiments. To measure the significance of the differences observed for each carotenoid within the two cultivars of the same crop, a Student's t-test was used where p < 0.05 was considered statistically significant. HPLC was used to identify and quantify individual carotenoid levels of lutein, zeaxanthin, β-carotene, lycopene and canthaxanthin from potato, tomato and wheat cultivars grown and consumed in South Africa. Our objective was to establish a reliable and optimal method that can be used for the future screening of other cultivars of these three crops. Individual carotenoids were identified on the basis of retention times and spectra compared with those produced from a mixture of pure standards. Figure 1 shows chromatograms representative of the carotenoids extracted from potato, tomato and wheat cultivars. Lutein was the first carotenoid to be eluted through the column just after 7 min, followed by zeaxanthin (± 8.384 min), canthaxanthin (± 9.150 min), β-carotene (± 15.952 min) and the last carotenoid of interest detected in this study was lycopene at approximately 34.435 min. The chromatograms indicated that a greater number of carotenoids have to be included for quantification when other cultivars are screened. Lutein was used as a measure for recovery of polar carotenoids whilst β-carotene was used as a measure of recovery of non-polar carotenoids. As expected, recovery rates varied between the three different crop matrices. For potato, average recovery rates of 70% for lutein and 60.79% for β-carotene were obtained. The recovery rates for wheat were 89.3% for lutein and 87.6% for β-carotene. For tomato, average recovery rates of 93.2% and 91% were obtained for lutein and β-carotene, respectively. Although the recovery rates for potato could be considered to be at a bare minimum, these values were considered sufficient for the purpose of this analysis, which was to optimise a single extraction method that could be used for screening crops of different matrices as efficiently and accurately as possible. Table 1 shows the carotenoid content of the eight cultivars. The potato cultivar Mondial had a higher total carotenoid content (0.730 µg/g) than the potato cultivar BP1 (0.464 µg/g). Figure 2 shows the variation in the levels of individual carotenoids identified in both potato cultivars. Lutein, zeaxanthin and β-carotene were the only carotenoids identified out of the five investigated in this study. An interesting observation between the two cultivars was that zeaxanthin was the major carotenoid found in Mondial potato, whereas lutein, the isomer of zeaxanthin, was the major carotenoid in BP1 potato. The concentration of zeaxanthin in Mondial potato was measured at 0.441 µg/g, which accounted for 61% of its total carotenoid content, and the concentration in BP1 potato was 0.120 µg/g, which accounted for 26% of its total carotenoid content. The concentration of lutein was slightly higher in BP1 potato than in Mondial potato. Although the difference in concentration was small, lutein still accounted for 71% of the total carotenoid content in BP1 potato and only 36% in Mondial potato. 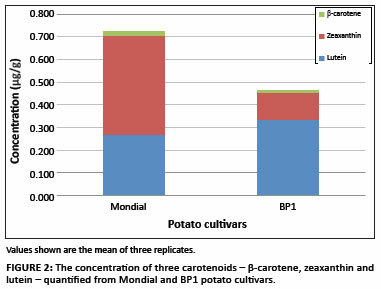 β-carotene was also detected in both potato cultivars, and accounted for 3% of the total carotenoid content in both Mondial and BP1 potato cultivars. Mondial potato contained a marginally higher content of the provitamin A carotenoid, β-carotene (0.0201 µg/g), than did BP1 potato (0.0142 µg/g). All five carotenoids of interest were detected in Roma and Salad tomato cultivars grown in South Africa. The total carotenoid content in Roma tomato was higher than that of Salad tomato, with average concentrations of 479.45 µg/g and 427.12 µg/g, respectively. Figure 3 shows the variation in the levels of individual carotenoids identified in both tomato cultivars. Lycopene, the major carotenoid in tomatoes, represented 92% of the total carotenoid content in Roma tomato, with a concentration of 443.09 µg/g, and 91% of the total carotenoid content in Salad tomato, with a concentration of 387 µg/g. β-carotene was the second highest component of the total carotenoid content in both tomato cultivars (Figure 3). In contrast to lycopene, Salad tomato contained more β-carotene than did Roma tomato. 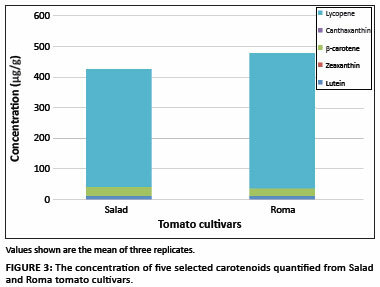 β-carotene contributed 5% to the total carotenoid content in Roma tomato (25.19 µg/g) and 7% in Salad tomato (28.94 µg/g) (Table 1). With lycopene and β-carotene being higher in the chain of carotenoid biosynthesis and available in high amounts, the remaining identified carotenoids were available in small or even trace amounts. There were no significant differences in the levels of lutein and zeaxanthin between the two cultivars. Roma tomato contained 10.867 µg/g of lutein whilst Salad tomato contained 10.810 µg/g. Only trace amounts of zeaxanthin were detected in the two tomato cultivars whilst canthaxanthin was marginally different between the two cultivars. 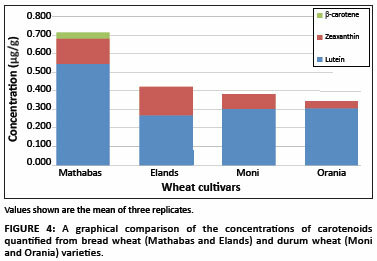 Figure 4 shows the variation in the levels of individual carotenoids identified in the wheat cultivars. Lutein and zeaxanthin were the only two carotenoids detected in both durum wheat cultivars and in the bread wheat cultivar Elands, whereas β-carotene was also detected in the bread wheat cultivar Mathabas. The absence of lycopene in the wheat varieties was no surprise because, to date, there have been no data reported on the presence of lycopene in wheat. Total carotenoid contents of bread wheat cultivars selected for this study were within the reported range for bread wheat varieties, that is, ranging from 0.1 µg/g to 2.4 µg/g.4,23,24 The Mathabas cultivar had a 40% higher average total carotenoid content at 0.716 µg/g compared to the Elands cultivar, which had an average total of 0.422 µg/g. Lutein was the major carotenoid detected in the bread wheat cultivars, followed by zeaxanthin (Figure 4). The concentration of lutein was significantly different between the two bread wheat cultivars, accounting for 75.5% of the total carotenoid content of the Mathabas cultivar (with an average of 0.544 µg/g) and 63% of the total carotenoid content of the Elands cultivar (with an average of 0.268 µg/g) (Table 1). A variation in the zeaxanthin concentration was observed between bread wheat cultivars, with zeaxanthin accounting for 40% of the total carotenoid content in the Elands cultivar and 20% in the Mathabas cultivar. β-carotene was only detected in the Mathabas extracts, at an average concentration of 0.034 µg/g, which may possibly account for the lower levels of zeaxanthin in the Mathabas cultivar compared to the Elands cultivar. Micronutrient deficiencies are very common worldwide, especially in developing countries.25 Supplementation and food fortification programmes are the traditional methods currently used to improve nutrient intake in vulnerable population groups.26 However, both methods have shown to be insufficient in eliminating deficiencies as they do not reach all the people who are affected and have also not proven to be sustainable because of the costs involved.27 Plant breeding for crops high in micronutrients has been proposed to offer the best and more sustainable solution to address food insecurity and nutrient deficiency, especially for remote rural areas.28 To ensure such strategies work, it is necessary to quantify the nutrient levels of highly consumed food crops, to screen for the best cultivars from the current breeding population and to make them available to small-scale farmers and subsistence farmers. In order to screen a large number of potato, tomato and wheat cultivars for five carotenoids, a simple and efficient extraction method, together with a robust HPLC protocol that could be used for all three crops, was required. The methods used in this study proved to be appropriate and robust because separate carotenoid peaks were observed on chromatograms produced from potato, tomato and wheat matrices. In addition to the identification and quantification of these five carotenoids, unidentified compounds, possibly other carotenoids, were also extracted and separated, as can be seen in Figure 1. However, the characterisation of these compounds was beyond the scope of this paper. The results obtained for potato cultivars were in agreement with those reported in the available literature. Total carotenoid content of Mondial and BP1 potato cultivars fell within the average range reported by Breithaupt and Bamedi29 for white fleshed potatoes (that is, between 0.38 µg/g and 0.62 µg/g fresh weight). This range was also comparable to that reported by Diretto et al.30 (0.5 µg/g - 2.5 µg/g fresh weight). Both of these studies used phase-separation methods, whilst in this study comparative data was obtained without separating the polar and non-polar phases. Furthermore, petroleum ether was used by both Breithaupt and Bamedi29 and Diretto et al.30, whilst we used hexane as the non-polar solvent. Lycopene, the major carotenoid in tomato, was a strong indicator of how efficient the extraction method was. Lycopene contents, in both Salad and Roma tomato cultivars, were exceedingly higher (± 3-fold) than those reported by Agarwal et al.31 and Khachik et al.32 (125.4 µg/g and 92.7 µg/g, respectively). The quantification of zeaxanthin from fresh tomatoes was an additional benefit because zeaxanthin levels in tomatoes have not been reported, mainly because zeaxanthin is present in very low quantities in tomatoes. The presence of a carotenoid in very low quantities can pose a challenge in such screening studies because levels could at times be too low to achieve a reliable measurement.24 We believe that the optimised methods of extraction and analysis developed in this study will minimise such challenges and will produce reliable data for South African crops, because levels as low as 0.045 µg/g were detected for canthaxanthin in durum wheat. Although it would be impractical at this stage to make a significant decision on which cultivar could be recommended to subsistence and small-scale farmers, the carotenoids data produced in this study is vital for crop-breeding purposes, where selective crop breeding may be used to overcome micronutrient deficiencies, especially those that exist in low-income South African households. In this study, it became apparent that there are significant differences in the content of individual and total carotenoids within South Africa's breeding populations of potato, tomato and wheat. Data produced from durum wheat cultivars also provide evidence that there is a need to identify and select wheat varieties that are rich in carotenoids, as both cultivars were more than 1000-fold below the reported average level of 1.5 µg/g - 5.0 µg/g.4,23,24 This finding validates the need to continue evaluating more cultivars to assist in the endeavour to combat vitamin A and other carotenoid deficiencies in South African rural communities. This work was supported by the South African Department of Science and Technology and by the European Union Project DEVELONUTRI, Framework 6 Programme. We acknowledge Mrs Judy Reddy and Mrs Lauraine Mlotshwa for technical assistance with HPLC.